After her Click'd catastrophe, Allie Navarro is determined to redeem herself. 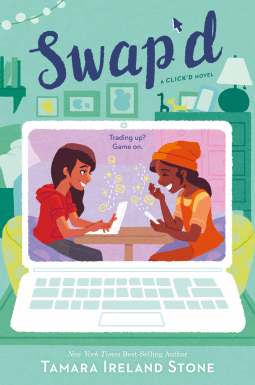 So when the class gets an assignment to create a mobile game from recycled code, Allie pairs up with Courtney, her best friend from CodeGirls camp, to create the perfect app: Swap'd. Kids buy, sell, and trade stuff at school all the time. Candy. Clothes. Video games. Slime. Why not make a fiercely competitive, totally anonymous, beat-the-clock game out of it? Once Swap'd is in full-swing, Allie is certain that it's the answer to all her problems. She's making quick cash to help Courtney buy that really expensive plane ticket to come visit her. It's giving her an excuse to have an actual conversation with her super-secret crush. And it looks like she might finally beat her archenemy-turned-friend, Nathan. She's thought of everything. Or? has she? The second book in the Click'd series by New York Times best-selling author Tamara Ireland Stone weaves together middle school friendship, first crushes, and serious coding skills in another fun, fast-paced, and empowering novel that will have readers cheering Allie on from the first page to the last.